Description: The Universe DVD is a brilliant video tour of over 200 amazing astronomical objects, featuring images from Hubble, SOHO, TRACE, and NASA's other orbiting space telescopes. 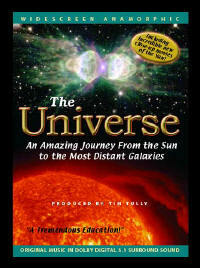 The Universe DVD sweeps you past distant galaxies and through magnificent nebulae, zooms up close to the inferno of the sun, and flies deep within dense clusters of dazzling stars. Includes incredible new close-up movies of the sun. Each of the eleven chapters showcases a different type of object, featuring a concise narration explaining every image. An original orchestral score beautifully complements the mystery and magnificence of these amazing cosmic phenomena. Written and produced by Tim Tully, Universe Productions. Original music written and performed by Paul. D. Lehrman. "Wow! What a nice show....Bottom line: a great DVD!" Minimum system requirements: DVD-Video player or DVD-ROM equipped, Pentium II computer. Microsoft Windows 95/98/NT/2000. 25 MB free hard drive space. MPEG-2 decoder with Dolby Digital Surround Sound. DVD-Equipped Macintosh will play title only using Apple DVD-Video player. Copyright 2003. If you're a space nut, or just want to bask in the glory of the Universe around us, have I got the DVD for you. It's called, not surprisingly, "The Universe" and it takes viewers on a journey that begins at the center of our solar system and ends as far out in the vast cosmic regions as technology allowed when the DVD was put together. And, as always should be when a DVD is being put together, the images are presented in anamorphic widescreen and fill the 16x9 television's screen completely, offering you a panoramic view of the wonders of nature (or God) that the disc displays. The footage is nothing short of amazing, and they kick things off right (after a short introduction to the telescopes themselves) with a fascinating look—including time lapse footage—of our Sun. This spectacular section, courtesy of NASA's SOHO and TRACE telescopes, lets you clearly see the source of life on Earth at work fusing its gases and emitting energy and radiation whether it be in the form of solar wind, gigantic prominences, or just big globs or trails of star stuff (to steal a phrase the late Carl Sagan used to great effect in his groundbreaking series "Cosmos") leaping from the star's surface and following its magnetic field until it's swallowed up again by our system's primary. It really is spectacular and to me this section alone is worth the price of admission because, while I'd seen plenty of sun shots before, nothing had come close to the detailed (and frighteningly beautiful) shots displayed here. I've been producing a commercial DVD titled The Universe, and one of the most challenging aspects of the project has been building the 5.1 surround soundtrack. The primary content of The Universe is a huge number of animated stills and movies showing the amazing astronomical images being sent to Earth by various space-based telescopes. The well-known Hubble Space Telescope captures images of cosmic objects ranging from within our own solar system out to unbelievably distant extragalactic regions. The less famous TRACE and SOHO telescopes shoot incredible close-up videos of the surface and corona of the Sun. From the initial stages, I planned to create the entire project in my home project studio. The tools were readily available, and I believed I could push the project through—at least to the replication stage—with only moderate additions to my audio-video setup. I knew it would be a challenge but that it would ultimately be worthwhile for a number of reasons.